Kitty Wells official website; accessed September 10, 2014. Wells was born Ellen Muriel Deason on August 30, 1919, one of six siblings, to Charles Cary Deason and his wife, Myrtle, in Nashville, Tennessee. (She is one of the few well known country performers to have been born in Nashville.) She began singing as a child, learning guitar from her father, who was a brakeman on the Tennessee Central Railroad. Her father, Charles, and his brother were musicians and her mother, Myrtle, was a gospel singer. As a teenager, she sang with her sisters, who performed under the name the Deason Sisters on a local radio station beginning in 1936. At the age of 18 she married Johnnie Wright, a cabinet-maker who aspired to country-music stardom (which he'd eventually achieve as half of the duo Johnnie & Jack). Wells sang with Wright and his sister Louise Wright; the three toured as Johnnie Right and the Harmony Girls. Soon Wright met Jack Anglin (who married Johnnie's sister Louise) and they became the duo Johnnie & Jack. Their band became known first as the Tennessee Hillbillies and then the Tennessee Mountain Boys. It was at this time she adopted "Kitty Wells" as her stage name. 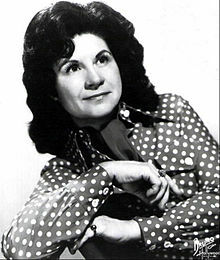 Johnnie Wright chose the name from a folk song called "Sweet Kitty Wells". Wells would tour with the pair, occasionally performing backup vocals. Before Wells' rise to stardom with "Honky Tonk Angels", Roy Acuff and the Smoky Mountain Boys toured with Wright and Wells for a time. Acuff advised Wright not to make his wife his show's headliner, because he thought women could not sell country music records. On Louisiana Hayride, she performed with her husband's duo. Wells, however, did not sing on their records until signing with RCA Victor in 1949 releasing some of her first singles, including "Death At The Bar" and "Don't Wait For The Last Minute To Pray", neither of which charted. While these early records gained some notice, promoters still weren't keen on promoting female singers, and therefore Wells was dropped from the label in 1950. In 1952, Paul Cohen, an executive at Decca Records, approached Wells to record "It Wasn't God Who Made Honky Tonk Angels". Wells was disenchanted with her career prospects and was considering retirement, but agreed to the session (at Owen Bradley's studio on May 3, 1952) because of the $125 union scale recording payment. "I wasn't expecting to make a hit," said Wells later. "I just thought it was another song." "It Wasn't God Who Made Honky Tonk Angels" was an answer song to Hank Thompson's "The Wild Side of Life", and its lyrical treatment of seductive, wayward women. Wells' single retorted, "It's a shame that all the blame is on us women." The record's message was controversial at the time, and was banned by many radio stations. NBC, in particular, was troubled by the lyric, "It brings back memories of when I was a trustful wife". Wells' slight alteration of "trustful" to "trusting" lifted the network ban on the song. It was temporarily banned from the Grand Ole Opry. Nevertheless, audiences couldn't get enough of it. The single took off during the summer of 1952, and sold more than 800,000 copies in its initial release. It was the first single by a female singer to peak at No. 1 in the eight-year history of the country music chart, where it remained for six weeks. (Certain female country songs, notably Patsy Montana's million-selling "I Want to Be a Cowboy's Sweetheart" predate the creation of Billboard's country chart in 1944.) "It Wasn't God Who Made Honky Tonk Angels" also crossed over to Billboard's pop charts, hitting No. 27. Thanks to her breakthrough, she received a membership to the Grand Ole Opry, which had originally banned the single. Writer Bill Friskics-Warren has argued that part of the song's appeal came from its combination of a modern message with a familiar tune, a melody drawn from the Carter Family's "I'm Thinking Tonight of My Blue Eyes" (as were "The Wild Side of Life" and Roy Acuff's "The Great Speckled Bird"). Practically anyone could hum along with "Angels" the first time they heard it. "It Wasn't God Who Made Honky Tonk Angels" was followed by "Paying For That Back Street Affair", a response to Webb Pierce's "Back Street Affair". The single reached number six in the spring of 1953, helping to establish a lasting place at the top of the charts for Wells. Between 1953 and 1955, she was popular on the country charts, and was the only female solo artist at the time to be able to maintain her success. In 1953, Wells had two Top 10 hits with "Hey Joe" and "Cheatin's A Sin". The next year, Wells partnered with country star Red Foley for the duet "One By One", which peaked at No. 1 on the Billboard Country Chart, and became her second chart-topper. The song led to a string of hit singles from the duo within the next two decades, including 1954's "As Long as I Live", which peaked at No. 3. As a solo artist in 1954, Wells had two major hits with the No. 8 "Release Me" and the Top 15 hit, "Thou Shalt Not Steal" (written by Don Everly of the Everly Brothers). Record companies were reluctant to issue albums by country's female artists until Wells proved that women could sell. She became the first female country singer to issue an LP, starting with 1956's Kitty Wells' Country Hit Parade, which consisted of her biggest hits. She released her first studio album in 1957 with Winner of Your Heart. Soon other female country singers released LPs in the late 1950s and early 1960s. "Making Believe" and "Lonely Side of Town" became chart-toppers for Wells, however not on Billboard magazine. Wells' later 1950s releases included "Searching (For Someone Like You)", "I Can't Stop Loving You", and "Amigo's Guitar", which she wrote with John D. Loudermilk. In 1957, Wells issued Winner of Your Heart. This was followed by a string of LPs released from Decca Records between 1957 and 1973. She also partnered with Webb Pierce the same year for two duet singles, including the Top 10 hit, "Oh So Many Years". The duo didn't record together again until 1964 with the Top 10 hit, "Finally". In 1959, Wells had two Top 5 hits with "Amigo's Guitar" and "Mommy For A Day". Wells was later awarded a BMI award for writing "Amigo's Guitar." Although not known much for her songwriting, Wells has won two BMI awards, including one for "Amigo's Guitar". She has published more than 60 songs. 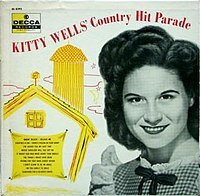 Wells' 1956 LP album, Country Hit Parade. She was the first female country singer to release an LP of her own. She continued to put much of herself into her songs throughout her career, inspiring other female country singers to record risky material as well. Loretta Lynn was one of her followers in this sense, when she recorded "Don't Come Home A Drinkin' (With Lovin' On Your Mind)" in 1967. Dolly Parton's 1968 recording "Just Because I'm a Woman", like "Honky Tonk Angels", questioned the male-female double standard. Wells entered the 1960s on top with songs like "Heartbreak U.S.A." and "Day into Night". "Heartbreak USA" peaked at No. 1 on the Billboard Country Chart and became her third and final No. 1 hit. The follow-up, "Day Into Night" was a Top 10 hit the same year. Owen Bradley continues as Wells' producer in the 1960s. Bradley produced some of the biggest-selling country crossover singers of the time period. The well-known Nashville Sound vocal group, The Jordanaires, can be heard backing Wells on her big country hit from 1961, "Heartbreak USA". In the early '60s she continued to have Top Ten hits frequently. In 1962, Wells had three Top 10 hits with "Will Your Lawyer Talk to God", "Unloved Wanted," and "We Missed You". Beginning in 1964, Wells' albums began to chart the Top Country Albums chart, starting with the LP, Especially for You. Some of Wells' albums peaked within the Top 10 on that chart. That same year, her singles began to return to the Top 10 with "This White Circle on My Finger" and "Password", both of which peaked at No. 7 on the Billboard Country Chart. In 1965, Wells had her last Top 10 hit with "Meanwhile, Down At Joe's" and in 1966, Wells then had her final Top 20 hit with "It's All Over But the Crying", which peaked at No. 14 on the country charts. During the late 1960s and 1970s, she managed to have a string of minor hits and remained a popular concert attraction. She continued with a string of Top 40 hits nearly until the end of the decade with her last Top 40 single, "My Big Truck Drivin' Man" in 1968. 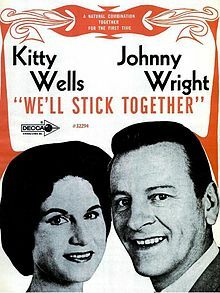 In 1968, Wells recorded a duet album with husband Johnnie Wright called, We'll Stick Together. Wells also reunited with Red Foley at the end of the decade for a studio album. Her albums continued to chart the Top Country Albums chart until 1969 with Guilty Street. She became the first female country star to have her own syndicated television show, with her husband in 1969, The Kitty Wells/Johnnie Wright Family Show, which also featured appearances by their children, including actor Bobby Wright. However, the program could not compete against shows starring more contemporary male artists like Porter Wagoner and Bill Anderson and only ran for one year. Wells stayed under the Decca label until 1973. She released three studio albums in 1970 and two in 1971. In 1973, when Decca became MCA Records, Wells stayed with them for a short period time, before leaving the label. In 1974 she signed with Capricorn Records, a southern rock label of the era, and recorded a blues-flavored album entitled Forever Young on which she was backed by members of the Allman Brothers Band and the Marshall Tucker Band. The album received considerable acclaim and, through its association with the Allmans, brought Wells to the attention of a younger audience. In 1976, she was inducted into the Country Music Hall of Fame. In the late 1970s, Wells and husband formed their own record label, Rubocca (the name was a composite of their three children's names: Ruby, Bobby, and Carol Sue) and released several albums. In 1979, at age 60, she was back on the Billboard charts, "I Thank You for the Roses". Wells remained a successful concert attraction at smaller venues throughout the country and Canada as late as the early 2000s. In 1987, she joined fellow Opry legends Brenda Lee and Loretta Lynn on k.d. lang's "Honky Tonk Angels Medley", nominated for a Grammy award in 1989. Wells' 1955 recording "Making Believe" was included in the soundtrack of the film Mississippi Burning. In 1991, Wells was awarded from the Grammy Awards a Lifetime Achievement award. She, along with Johnnie and Bobby, joined producers Randall Franks and Alan Autry for the In the Heat of the Night CD "Christmas Time's A Comin'" performing "Jingle Bells" with the cast on the CD released on Sonlite and MGM/UA for one of the most popular Christmas releases of 1991 and 1992 with Southern retailers. In 1993, Wells appeared on Dolly Parton, Loretta Lynn and Tammy Wynette's collaboration, Honky Tonk Angels, joining in on their recording of the title track. Wells and her husband opened the Family Country Junction Museum and Studio in 1983 in their hometown of Madison, but stopped running it on their own in 2000. Their grandson, John Sturdivant, Jr. has kept the Junction Recording Studio at its present location which also houses Junction Records. Wells and her husband-singing partner of 63 years performed their final show together on December 31, 2000 at the Nashville Nightlife Theater; they had announced their retirement earlier that year. Wells was ranked No. 15 on CMT's 40 Greatest Women of Country Music in 2002. An exhibit honoring Wells at the Country Music Hall of Fame and Museum in Nashville ran from August 2008 through June 2009. On May 14, 2008, "It Wasn't God Who Made Honky Tonk Angels" was added to the National Recording Registry at the Library of Congress, along with Roy Orbison's "Oh, Pretty Woman". Wells married Johnnie Wright in 1937. She was widowed 33 days before their 74th wedding anniversary when Johnnie died in 2011, aged 97. Kitty and Johnnie had three children, Ruby, Bobby, and Carol Sue, eight grandchildren, 12 great grandchildren, and six great-great grandchildren. Carol Sue released a single with Wells in the mid-'50s titled "How Far Is Heaven", which peaked at No. 11 on the Billboard Country Chart. While two of Wells' children pursued music careers, Carol Sue did not, but was married to Nashville Music Row executive John Sturdivant, Sr, and recorded numerous songs with her family, including performing with Ruby as The Wright Sisters. Ruby recorded an album for the Kapp label, and was a member of 'Nita, Rita, and Ruby. Bobby recorded albums for both Decca and ABC. Wells and her husband were lifelong members of the Church of Christ. The couple celebrated their 70th wedding anniversary in 2007 by visiting the small courthouse at which they were married in Franklin, KY. Kitty and Johnnie were married 74 years before Johnnie’s death in 2011. Kitty Wells died on July 16, 2012 in Madison, Tennessee, from complications of a stroke. She was 92. She is buried at Spring Hill Cemetery in Nashville, Tennessee, alongside her husband. ^ Dave Paulson (July 16, 2012). "Kitty Wells, 'Queen of Country Music', dies at 92". The Tennessean. Retrieved July 20, 2012. ^ a b c Lewis, Randy (July 17, 2012). "Kitty Wells dies at 92; country music trailblazer". LA Times. Retrieved January 10, 2013. ^ a b c d e f g Friskics-Warren, Bill (July 16, 2012). "Kitty Wells, Trailblazing Country Singer, Dies at 92". New York Times. Retrieved January 10, 2013. ^ a b c d Brian Mansfield & Stephen Thomas Erlewine Kitty Wells biography, Allmusic.com; retrieved June 12, 2008. ^ Wolff, Kurt (2000). In Country Music: The Rough Guide. Orla Duane, Editor. London: Rough Guides Ltd. p. 154. ^ a b McArdle, Terence (July 16, 2012). "Kitty Wells, country music star, dies at 92". Washington Post. Archived from the original on January 3, 2013. Retrieved January 10, 2013. ^ Pugh, Ronnie (July 16, 2012). "Kitty Wells Dies at Age 92". CMT. Retrieved January 10, 2013. ^ Roberts, Randall (July 16, 2012). "An Appreciation: A trailblazin' Kitty Wells". LA Times. Retrieved January 10, 2013. ^ "Kitty Wells, Pioneering Country Singer, Dead at 92". Rolling Stone. July 16, 2012. Retrieved January 10, 2013. ^ a b Country Music Television.com Kitty Wells profile, CMT.com; retrieved June 13, 2008. ^ a b Kitty Wells' story Wells' Country Music Hall of Fame profile Archived 2007-09-26 at the Wayback Machine; retrieved June 12, 2008. ^ All of those lyrics use essentially the same tune. ^ (2006). In Will the Circle be Unbroken: Country Music in America. Paul Kingsbury & Alanna Nash, Editos. New York, NY: Dorling Kindersley. p. 182. ^ a b c d Elizabeth Wenning Biography, musicianguide.com; retrieved June 12, 2008. ^ Yahoo.com Kitty Wells page; retrieved June 13, 2008. ^ Robert K. Oermann (July 16, 2012). "Kitty Wells, The Queen of Country Music, Passes". Music Row. Retrieved July 20, 2012. ^ Countrypolitan.com Kitty Wells artist biography Archived 2011-09-28 at the Wayback Machine profile information; retrieved 6-13-08. 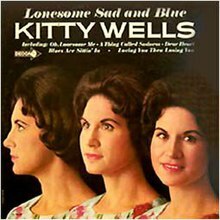 ^ Kitty Wells' newsite, cmt.com, April 21, 2008; retrieved June 13, 2008. ^ Gerome, John (September 20, 2008). "A tip of the hat to singer Kitty Wells". Associated Press. Retrieved January 10, 2013. ^ "National Recording Registry Master List-204". Library of Congress. Retrieved September 6, 2013. ^ Sachs, Bill, ed. (June 16, 1958). Folk Talent & Tunes. Billboard. p. 41. Retrieved September 6, 2013. ^ Whitburn, Joel (2008). Hot Country Songs 1944 to 2008. Record Research, Inc. p. 476. ISBN 0-89820-177-2. ^ "'Queen of Country Music' Kitty Wells dies". WKRN. July 16, 2012. Archived from the original on July 18, 2012. Retrieved July 16, 2012. ^ "Kitty Wells, country music star, dies at 92". Reuters. 2012-07-12. Retrieved 2012-07-16. ^ "Remembering Kitty Wells, The True Queen Of Country". Remembering Kitty Wells, The True Queen Of Country. American Songwriter. Retrieved July 18, 2012. ^ "Kitty Wells (1919–2012) – Find A Grave Memorial". Findagrave.com. 2012-07-16. Retrieved 2016-11-07. Wikimedia Commons has media related to Kitty Wells. Kitty Wells at the Country Music Hall of Fame and Museum; accessed December 19, 2016. Kitty Wells obituary, Grammy.com; accessed September 10, 2014. Kitty Wells Interview NAMM Oral History Library, July 24, 2004.